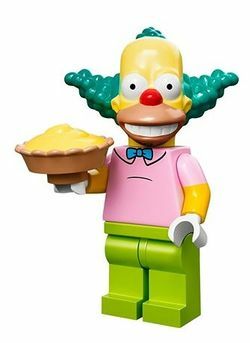 Krusty the Clown is a minifigure released in 2014 as a one of 16 minifigures in The Simpsons theme. Krusty, like other minifigures from The Simpsons theme, has a unique head piece. It features bubbly teal hair, a red nose and a beige jaw line. The torso depicts a pink short sleeve collar shirt with a blue bow tie. The leg piece is lime green. The figure carries a pie as an accessory. Facts about "Krusty the Clown"
Krusty the Clown Krusty the Clown is an all-around funnyman, entrepreneur, and TV kiddie-show host. As a child, young Herschel Krustofski would do anything for a chance to entertain. As an adult, Krusty the Clown will put his name and image on anything if it will help him make a quick buck. This page was last edited on 12 January 2016, at 23:07.